CHICAGO (AP) Just when it looked as though Yu Darvish might be rounding back into form, the Cubs right-hander suffered another setback. Chicago manager Joe Maddon hopes it won’t be a major one. 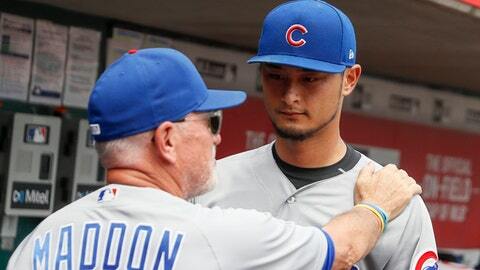 The Cubs placed Darvish on the 10-day disabled list Saturday with right triceps tendinitis, continuing his rough season. Darvish is 1-3 with a 4.95 ERA in his first season after signing a $126 million, six-year deal with the Cubs in February. He was slated to start the series finale against the Giants on Sunday night, but Tyler Chatwood will move up a day to take his place. The 31-year-old Darvish had been showing signs of a turnaround, pitching six innings of two-hit ball last Sunday at Cincinnati for his first win with his new team. He has allowed just two runs and five hits in his last 10 innings. The DL move was made retroactive to Wednesday. The Cubs did not immediately announce a starter for Monday’s series opener at Pittsburgh. ”When I talked to him in my office, it didn’t sound awful,” Maddon said, ”but it did sound like something was there. Darvish did not speak with reporters Saturday. Darvish underwent Tommy John surgery in March 2015 while with Texas. He missed the 2015 season and didn’t make a start for the Rangers until May 28, 2016. The Cubs also optioned catcher Victor Caratini to Triple-A Iowa before their game against San Francisco. Veteran catcher Chris Gimenez and left-handed reliever Randy Rosario were brought up from the minors, and infielder Efren Navarro was designated for assignment. The 24-year-old Caratini appeared in 26 games with Chicago, batting .262 with four RBIs. Maddon said the move was made primarily to get him more playing time. Gimenez, 35, signed a minor league contract with Chicago over the winter after a combined nine seasons with five major league teams. He played for Maddon with Tampa Bay in 2012 and 2013 and had some success with Darvish with Texas in 2014.